What kind of add-on suits your workflow? 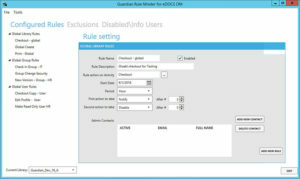 Control the OpenText eDOCS environment as an administrator. Add-ons that increase functionality to control the OpenText eDOCS environment. Archiving of inactive or finalized content with the power of OpenText eDOCS. Using the strength of OpenText eDOCS archiving with additional features and uses. Capture and create new content in more efficient and effective ways within OpenText eDOCS. New content creation made easy with add-ons that increase functionalities. Distribute content to internal or external recipients from within OpenText eDOCS. Internal distribution between users and departments. External distribution to clients, business relations or others. Effective content revision and management tools. Manage content while working within OpenText eDOCS. Allows for content revision and movements. Additional security possibilities for OpenText eDOCS that complement the existing layers of security. Adding security in other aspects of OpenText eDOCS will create an even safer working environment. 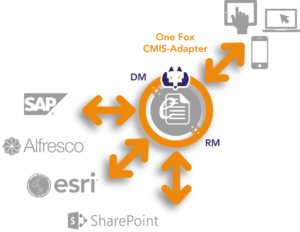 The CMIS-Adapter gives you a uniform way of integrating OpenText eDOCS DM/RM with other business applications while increasing the interoperability of your eDOCS platform. Powered by One Fox | Why an eDOCS marketplace?